Brekky with Kirste and Morro parked their mobile studio on the grounds of the picturesque Grovelands Primary School for 98five’s first fortnightly Free Coffee Friday of the year. 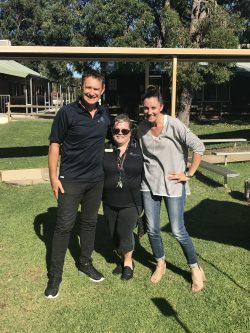 The show caught up Year 1 and 2 teacher Brett Whiskin who has been inspiring his students to take up computer coding, YouthCARE chaplain Kim Scaddan and Aboriginal and Torres Straight education officer Michelle Ninyette who has been keeping students feed every day with her breakfast club – including some kids close to her. “My children have come through this school and now my grandchildren are here,” Ms Ninyette said. With breakfast lovers extending far and wide, the club has continued to grow over the years. School Principal Mark Bradshaw championed the school’s ‘You Can Do It’ program — an initiative that develops student’s social and emotional capabilities. “It’s a great community, I’ve been here two and a half years and our focus is on engaging community,” Mr Bradshaw said. “You have to put aside the myths (of Armadale)…there are things that happen here and other places that aren’t good but when you meet people face-to-face and deal with them on a daily basis, and meet the young people in particular, in my experience, young people are the same everywhere. Yes, there’s different socio-economic (issues). They need adults to show them the way – good, fair-minded, reasonable adults that listen and care about them. “The strength of this school community with its staff has been historical, they’ve always cared deeply for this school. Mr Bradshaw said the ‘You Can Do It’ message is “send your kids to our school, to your school and we will teach them how to do it”. For a different kind of breakfast club, teachers and parents were able to indulge in free coffee and donuts thanks to 98five friend, ice cream van man, Paul.